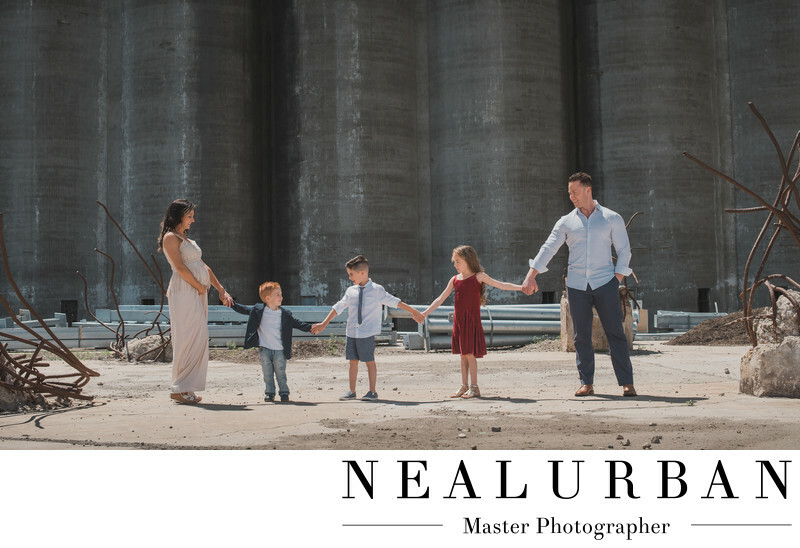 Family portrait sessions can be so much fun! We love going to different locations and hearing ideas that families have. For the Primerano family session, they wanted something really different then a park or nature style shoot. We suggested Buffalo River Works (also known as Silo City) in Buffalo. They had never been here, but loved the style we described to them. It would be rundown style buildings with old grain elevators. There were also repairs and renovations going on, so there were big work trucks. This was cool for the boys! We did use some of the trucks for solo portraits with the little guy. He loved trucks! He actually had a toy truck with him on the shoot. This image is really fun! We loved the grain elevators in the back. The whole family is hand and hand. Then they all looked down to the little boy. His reaction was so cute when he looked up to his older brother and sister. You can also see, mom is holding her pregnant belly! This also ended up being a mini maternity session as well! They are expecting twins! We were so excited for them when we heard the news! We have worked with the Primerano Families a lot for photos! We photographed another brothers destination wedding in Jamaica! There, this same mom (brother in law to the groom) was pregnant with the youngest boy in the photo. We did some quick beach maternity photos for her in Jamaica after the wedding! It was gorgeous! And it was so nice to be able to do this family portrait session with the kids all growing up and waiting the arrival of their new siblings! Location: 359 Ganson St, Buffalo, NY 14203.